By 1963, when the decision about the location of Federation's next home was made, the exodus to the suburbs was almost complete. A few Jewish families still lived in Glenville and there were many in the Shaker Square area (in the city of Cleveland, but in the Shaker Heights school district). Already in the "Heights" or Beachwood were the major Jewish agencies and the congregations, including Heights Temple (1926), Park Synagogue (1950), Fairmount Temple (1957) and Oheb Zedek - Taylor Road Congregation (1959). Only The Temple-Tifereth Israel (in University Circle) and Beth Israel - The West Temple (eight miles west of downtown) remained within the city limits. 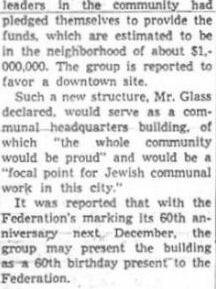 The first published news of the proposed new Federation building was the story below, at the top of the front page of the Friday May 31, 1963 issue of the Jewish Independent. There was no public campaign to raise the funds for the building. An estimated $1,000,000 came from a quiet solicitation of leading citizens. The donors were given a few years to furnish their gifts and all agreed that they would not reduce their giving for Federation's annual campaigns. ... 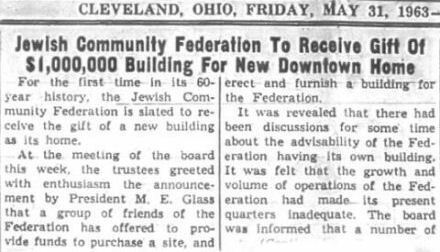 In 1965, when the Federation erected its own building, the organization's leaders chose a site downtown at 18th and Euclid to symbolize the Jewish Community Federation's commitment to the greater community. No further mention of the new building can be found on the pages of the Jewish Independent. Not on site selection, naming the architect, groundbreaking or more. Only when the new building at 1750 Euclid Avenue was complete and ready to be dedicated would there be more publicity. And only at the dedication ceremony would the donor names be announced. They were identified on a plaque that is still mounted in the lobby, near the front door. This plaque is now on display in Federation's new offices in Beachwood. Edward Durell Stone was one of the nation's leading architects. He had won attention for buildings such as the U S Embassy in New Delhi and the next year he would be selected to design the Kennedy Center in Washington DC. 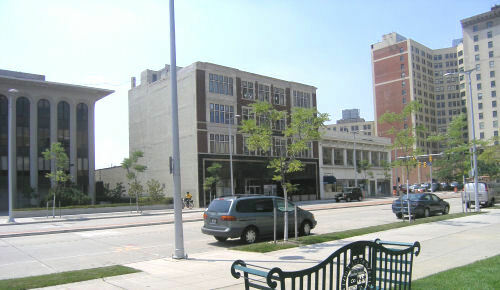 Weinberg & Teare's next downtown project was the Chesterfield Apartments on Chester Avenue at East 12th Street. The September 17, 1965 Cleveland Jewish News announced the dedication of the new building. Cleveland Mayor Ralph Locher said it represented "more than bricks and mortar - it is a symbol of humanity and philanthropy in a city that cares." Federation also adopted a new emblem which incorporated the form of the new building. The new building housed a staff of 50 and could host several meetings at a time, with groups of up to 100. These were the days before the great productivity tools - the personal computer, networks, voicemail, email and websites - were available. Computing, vital for mailing lists, campaign management and accounting, was done by a room-sized "main-frame" computer. As the years went by, with the Jewish community steadily moving east, most smaller meetings would be held early or late in the day in east suburban locations. Except for public rallies, which might take place at Public Square, community-wide meetings would be held at congregations or other public venues in the suburbs. Our pages describe one such meeting, held in 1965 at Cleveland Heights High School. more..
A 2008 photo, looking north on East 18th Street. The same month (September 1965) that Federation's building opened, Fenn College became Cleveland State University. In the years since, CSU has transformed the area from East 17th to East 27th Streets. One new Cleveland State building, the glass-enclosed College of Business, can be seen north of Euclid Avenue. See a CSU campus map. Another 2008 photo, looking west on Euclid Avenue. The donors hoped to see improvements between their new building and East 14th Street. That did not happen: the south side of Euclid Avenue has seen little change. 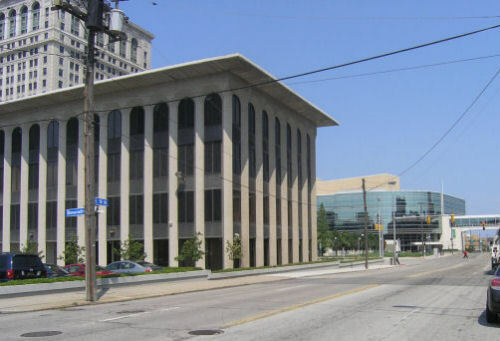 At the far right is the Hanna Building, where the Cleveland Foundation has been located since 1984. But on the north side of Euclid Avenue they were prescient. In 1970 Ray Shepardson and the Playhouse Square Association, helped by the Junior League of Cleveland, started renovation of the old movie houses. Then came the 522-performance run of Jacques Brel in the lobby of the State Theatre. With the support of the Cleveland Foundation and Cuyahoga County a rejuvenation of Playhouse Square was achieved. To look around Euclid Avenue and East 18th Street with Google Maps and Street View�, click here. 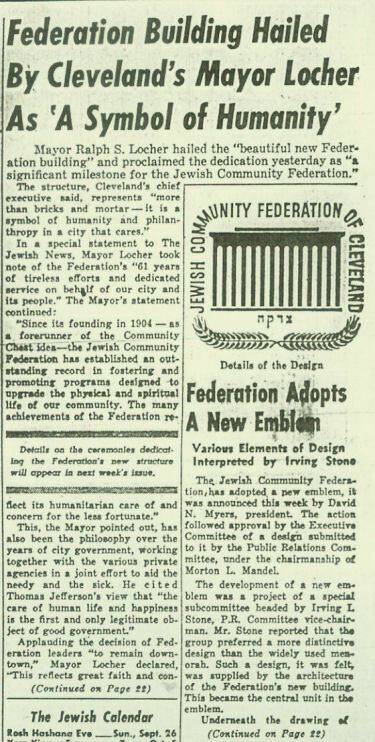 The September 17, 1965 issue of the Cleveland Jewish News included a eight page supplement devoted to the new building and to the history of Federation. Read its first page, by Joseph Berne, which discusses how the building came to be and its location.